Leeds United's Pablo Hernandez and Kemar Roofe have been nominated for the August Player of the Month award. 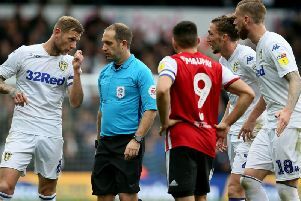 Leeds United duo Pablo Hernandez and Kemar Roofe have seen their red hot starts to the Championship season recognised by being nominated for the PFA Fans Player of the Month award. Playmaker Hernandez notched three goals and two assists in five games during the month of August, while striker Roofe bagged four goals and two assists in six games during the same period. The Whites pair have been nominated by the PFA for last month's gong alongside Brentford's Neal Maypay, Bristol City's Andreas Weimann, Middlesbrough's Darren Randolph and Wigan's Nick Powell. Click here to cast your vote for August's PFA Championship player of the month - who will you vote for? Let us know your choice in the comment sections below.